Reading Alan Gould is like the frisson of being back at uni, feeling rapt in admiration of those students so much smarter than me, but being just smart enough to enjoy their jokes. Claude Boon and Henry Luck, young poets in quest of their muses, cut a swathe through the cultural capitals and byways of Europe and Asia towards the end of the Cold War. 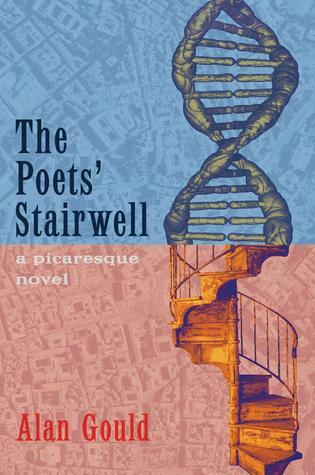 The Poets’ Stairwell revitalises the picaresque novel. Vibrant, sensuous and layered, it has a tumble of characters and pranks. Anarchist puckish Beamish, the Isadora Duncan-like Eva, class warrior, Branca, a libidinous translator of poems with Jelena, her iconoclast daughter, Luc Courlai a jailed French philosopher, Titus the Yankee acrobat who cradles his gun like a baby, Mr Hark a saintly Irish funeral director, Willi a German truck driver versed in Thomas Aquinas and sensible Rhee, Henry’s girlfriend – amongst others. Behind this company lives a virtual one of poets and philosophers from Yeats to Plato, attending as time and place invoke them. Our picaros’ adventures allow Alan Gould to discuss poetic inspiration from womb to self-conscious maturity. The tale of Martha the American plumber will make you cry. There is Sir John Cue the obstetrician who delivers Boon twice across a lifetime to round out the plot. And the meeting with Ted Hughes is not to be missed. Illness and poetry, here was an antique theme. Following this argument with Eva, Henry went down with a bad cold and, given how meagre were the t-shirts he wore beneath his suede jacket, this collapse was unsurprising. The intellect that could seize upon the gist of Hegel hardly knew how to dress himself properly against the Canberra frosts. For three weeks his nose dripped, his body drooped, and his complexion became more spectral than usual. Rhee made soup for him, his English Honours set felt vaguely anxious about his mortality, perhaps with Keats or Chatterton in mind. But Henry Luck, scholar, worked on through his infection, churning his essays on Wittgenstein and Wordsworth. Once when I visited him, I found him in his chair, on his lap a book with a bright red cover, around him a snowdrift of dropped tissues, and the sight of his soggy person hunched around that eye-catching book was like seeing through fog where a furnace glowed from some open kiln door. I was at uni at the same time as Alan Gould; we seem to have studied the same poets. This novel is a delight. Lisa, I have to ask: how many hours in a week do you read? Whatever it is, the results are impressive! That’s a tricky question. When things are ‘normal’ I read for 2-3 hours at night, and maybe for an hour over breakfast. But when insomnia strikes, as it did this week, I might read all through the night until dawn. 600 wpm: that’s an average-length novel in under 3 hours. Super impressive! I can only manage about 200wpm…..I feel so slow. It’s not a big deal. At the end of the day it’s about the pleasure you take in reading.